Presentations are becoming an important part of our professional lives. 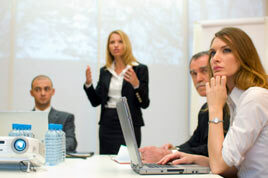 Companies are continually having meetings, training sessions and Exhibitions. The good news is you don’t have to purchase expensive projectors for once off presentations. At projector hire we can meet your requirements by providing you with the appropriate projector for your needs. We have a wide range of projectors for hire which are suitable for any organization both large and small, and we have excellent daily and weekly rates. All Our previous and existing customers in Cork are highly satisfied with our products, services and support and this is why Projector Hire has become the No.1 Audio and Visual Company in Cork. Some of our corporate clients include Meteor Cork, Smart Telecom Cork, Vodafone and Debenhams. Feel free to get in touch with us to discuss your requirements via phone 087-9850714 or email info@projectorhire.ie and we will be delighted to help you out in every possible way. Projector Hire © Copyright 2004-2010. All rights reserved. Projector Hire - Irelands leading projector hire company!